As a rule, I generally don't 'do' high street stores, mainly because I will thrift for what I want in the charity shops or the boot sales. When I do want something in particular, then it is obviously easier to hit the shops. 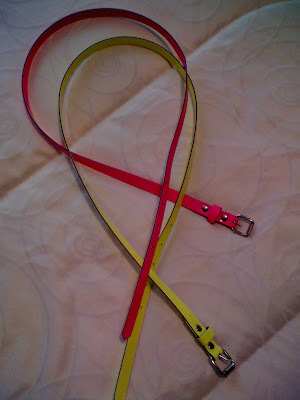 I wanted some neon skinny belts, so I went to the first place that seems to be bang on trend for most things-Primark. I don't generally shop in Primark on a regular basis, but do like to check it out once in a while, as they have trendy fashionable items at such cheap prices. These belts will break up an all black outfit, go with denim and also white in summer too! Whats been your best bargain for spring or summer so far? Those are great and you can't beat the price. Hi Wendy-cheap and cheerful does the job, thanks my dear! can't wait to see how you wear them sharon. no bargains yet, but i'm trying to save up for something special to come! very cool and what a price! Very nice price! & so cute! Those are fantastic! Can't wait to see them in action. Hint: if you buckle them to each other, you can make a double wrap belt! Oh, I agree with CC! Double belt! Good idea! Nice belts you got there! So far, I have thrifted (! I took an inspiration from you) a paisley blouse for summer, bought a skirt at Zara and then of course I have that white lace dress from Valentine's vintage internet shop, and I think those were my best buys for summer so far! Hi everyone-thanks for the fab comments! Couture Carrie, thanks for a super idea and Cate, love the sound of your finds, lovely bargains!! LOve CCs idea! My favorite buy so far is my white vintage Carolina Herrera jacket. Oh Sharon! Those are awesome belts, and for such unbeatable price! Nice belts! As you say, you don't visit Primark often, I barely ever venture into a Peacocks shop, and was so delightfully surprised when I picked up an adorable floral summer dress for £15! Amazing! I can't remember my latest bargain buy! Is that bad? Though I did pick up a skirt at Brick Lane market this weekend for a mere £13 which is awesome by my standards! S that is very pretty, super savvy! Those are a bargain and perfect for this season honey! neon is huge this season. Love both colours! Who doesn't love a great bargain? Those are such fun colors. I haven't found any bargains yet. Unless getting 11 yards of fabric for 6 bucks counts. Thanks so much for the note. I suppose the weather is probably warming up there. Hope you had a safe St. Patrick's day. Hi everyone-thanks for your lovely comments, look forward to seeing all your fab bargains hopefully! I still can't believe neon is making a comback! Hi everyone-thanks for the lovely comments, Christine, thanks for stopping by too!! !